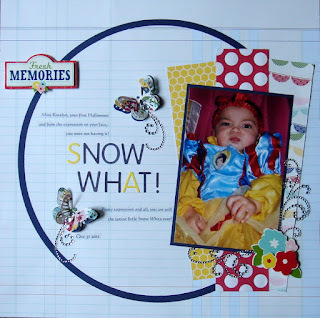 GrandDiva's Creative Corner: Snow What! Happy Friday! Here is a layout I created using Scrapbook Challenges Sketch #274. Loving the little pouty face my granddaughter Katelyn is wearing in this photo! I don't think the old wicked witch will be scaring this cute little Snow White! LOL Layout was completed using Pebbles Fresh Goods papers and embellies!